The term “onboarding” comes from the aviation industry — “onboard the plane.” Imagine the situation: you are at the airport waiting for boarding. You get on the plane, where you meet polite, smiling flight attendants. They help you find your seat, place your luggage, and feel comfortable during the flight. Of course, you could find your seat and put your luggage in the bin yourself. However, the crew’s task is to make you feel calm and secure. Let’s translate this into corporate language. We hire a new recruit and must make their “boarding” and “flight” fast, comfortable, and stress-free. The process of immersing new hires into a new work environment is called new employee onboarding. Through it, they acquire the skills, knowledge, and behaviors needed to become an effective member of the organization. Take your seat and fasten your seatbelts; we are preparing for takeoff! You are enjoying your flight, sitting in a comfortable chair with a cup of tea that a courteous stewardess has just brought you. Good memories about this pleasant journey will stay with you for a while, and when you decide to visit some other place, you will likely choose this airline again. It’s the same thing with a corporate environment. According to a survey, nearly one in three people quit a job within the first three months. Of course, no company wants a newly hired employee to leave in such a short time. Therefore, it’s in the interests of the organization to create an environment that has all the staff involved in the workflow. This is exactly how a well-thought-out new employee onboarding process can help. What must an onboarding program include? Dr. Talya Bauer from the SHRM identified The Four C’s which a successful onboarding program must include. The Four C’s stands for compliance, clarification, culture, and connection. Compliance implies teaching new hires the basic policies of the company. Clarification refers to ensuring that employees are aware of their responsibilities and how to correctly fulfill their role. Culture involves the norms of organization. Connection means relationships with colleagues and feeling like a part of the team. A new employee onboarding program can take several weeks or longer. However, many onboarding specialists agree that the adaptation period should last at least three months. 90 days is the bare minimum for new hires to get used to their roles, mentally prepare for their responsibilities, feel valued and supported, and get the knowledge and skills necessary to succeed. Extended onboarding can also decrease time to productivity and increase ROI for an organization in regards to the employee. How to make onboarding effective? Flying on a plane is stressful for many people. It’s like the first few days (or weeks) at a new job for an employee. Just as flight attendants can reduce the passengers’ stress through compassionate customer service, companies can make their employees’ experience more relaxed through well-organized onboarding. Here is a basic onboarding checklist you can reuse with every new hire. It contains all the items that are necessary to make the employees feel at home. 1. Provide a job description with responsibilities. 2. Prepare the benefits package that comes with the job. 4. Prepare a fully functional workstation (furniture, computer, desk supplies). 5. Give access to any tools they will need (corporate email, company phone line, social accounts). 1. Help your new hire complete all HR and payroll forms (or complete online ahead of time). 2. Take your employee on a tour around the facilty. 3. Introduce them to the department staff. 4. Assign a mentor who will help your employee throughout the onboarding process. 1. Have the manager set up a 1-on-1 to discuss 30/60/90 day goals for the new hire. 2. Arrange meetings for the new hire to meet with key stakeholders. 3. Take your new employee out for lunch to talk to them in an informal environment. 4. Setup a social event for your new recruit’s team at the end of the week to celebrate the new hire’s first week. Now, you have a list of what you need to do. Prioritize the objectives: divide them into what you should do before the first day, on the first day, and in the first week. However, don’t overload your employees with new information. 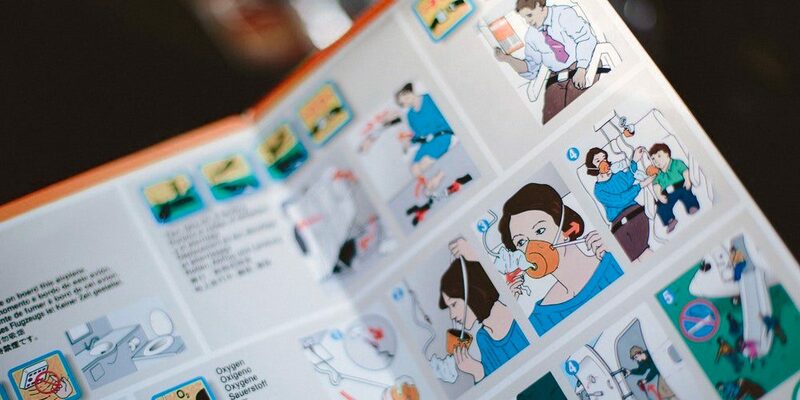 Flight attendants’ duties include giving instructions to passengers on how to behave on board and use emergency equipment. As for employee onboarding in your company, it’s also important to provide new hires with necessary knowledge and help them improve their skills. You need to make up a training program that is a roadmap with goals and responsibilities for each period of time. Here’s an example for a new sales hire. Goals and objectives Study the steps of the sales process, learn to predict and shape customers’ needs, present products in terms of customer benefits, handle objections, and close sales. Make the first sale. Knowledge and skills Know the steps of the sales process, objections, funnel questions and answers to them, sales closing techniques. Know how and what to say about competitors in the market, their products and their strengths and weaknesses. Be able to work with the mail. Business proposal templates, call records, chats. Face-to-face assessment on cases – Head of Sales Department / Sales Director. Decision on moving an employee to probation. When it comes to introducing employees to your corporate culture and training them, you can maximize the efficiency by using a Learning Management System (LMS). t will help you manage the whole training progress: create learning paths, upload and assign learning materials, and assess employees’ results. It helps you organize your onboarding process and learning materials. It saves you time. You can set up all the training in advance and, when new employees arrive, just assign them courses that suit their job role. It doesn’t require many coaches, scheduled classes, special equipment and other such expenses. Your new employees can go through the courses at their own pace. Both learners and instructors can track the completion status and results. When you are onboard a plane, you want to feel comfortable. In-flight meal, movies, and free Wi-Fi are just few ways that airlines enhance the passenger travel experience. The more bells and whistles you get, the more likely you will choose the airline next time. It’s also very true when it comes to a corporate environment. The more employees are engaged, the more effort they are willing to invest in the company’s goals and outcomes. According to Gallup research, only 13% of all employees are “highly engaged” at work, 63% are “not engaged,” and 26% are “actively disengaged.” To boost your employees’ effectiveness, it’s crucial to engage them at the onboarding stage. Each piece of learning content (video, article, course, etc.) must be created with a purpose, and that goal should reflect the needs of your employees. If a piece of learning content solves their current problem, they will be motivated to study it. Relevant content that is interesting and inspiring can be even more effective. However, one out of every three employees says that relevant content that is boring makes them feel miserable. This means you need to develop training programs that not only provide knowledge to employees, but also entertain them. Tip 3: Make interactive high-quality courses. To learn more about engaging eLearning content, see this complete guide about how to create online courses. Tool requirement: An authoring toolkit for creating courses. In iSpring Suite, you can develop quality SCORM-compliant courses, quizzes, conversation simulations, and video lectures that will work on any desktop or mobile platform. The toolkit is seamlessly integrated with PowerPoint, so anyone who’s created PPT presentations can easily build courses with iSpring Suite. People like to solve challenging problems, and feel inspired when they see their progress. You can add game mechanics in their training: rising up through levels, leaderboards, high scores, winning badges, and so on. It boosts their engagement and motivates them to conquer new peaks. iSpring Learn supports leaderboards to involve learners in competition and points and badges which can be assigned to learners for successfully completed courses and quizzes. Appreciation is an important factor of employee engagement and motivation to keep moving towards goals at work. Your colleagues are likely to aim higher and better if you demonstrate your appreciation by issuing electronic certificates for the assignments they have completed. iSpring Learn allows you to upload PDF certificates to the platform and deliver them to your learners upon completing courses. Learners can download and print their certificates, and share them with friends, relatives, and co-workers. Modern learners are extremely busy; they have to retain a huge amount of information. Flexibility and mobility can save the day. Let your employees learn whenever it’s comfortable for them from the deviсes they use most often. iSpring Learn supports fully responsive courses that adapt to the screen size of any device. Plus, it has a free mobile app that allows learners to take courses even offline. The autopilot is on, but the pilot is constantly monitoring the instruments, making sure they are on course. When it comes to onboarding, it’s crucial to make sure your employees are flying in the right direction. The most objective way to evaluate your new hires’ success is to use real numbers and calculations. Let’s take for example a sample one-week program for salespeople. From the Knowledge check column, we find out that an employee should pass four online quizzes and one face-to-face assignment. A learner gets points for the tests assigned in the LMS and the grade for the assessment from the Head of Sales. After all the tasks are completed, the manager sees the total number of points. If the result meets the minimum passing score set by the coach, the employee moves to the following step of onboarding. iSpring Learn LMS allows you to get full control over learners’ progress on every course. It not only lets you assess their results, but also provides you with attempt details, answer breakdown, average score, and much more. To learn how to use metrics to boost learning effectiveness, see this full guide on LMS reports. Each employee’s onboarding experience ends, sooner or later, but their professional development never does. Through eLearning, your whole staff will be able to constantly acquire new skills and improve themselves as professionals. You can make the training process easy and engaging with iSpring Learn LMS. Get a free 14-day trial and explore all the LMS features without spending a cent right now. Tracie Cantu SHRM-SCP is the founder of Metamorphosis Learning, a talent development firm committed to working with SMBs and start-ups to build and launch learning programs and systems that improve performance, increase employee engagement, and improve retention and talent attraction. Tracie has worked in Learning and HR leadership capacities for organizations such as United Airlines, the State of Texas, and Whole Foods Market. Clive Shepherd, learning consultant, Founding Partner at Skills Journey. In a career spanning more than 35 years, Clive has headed up a corporate training function, co-founded a leading multimedia development business, and operated as an independent consultant operating worldwide. He is a regular speaker at international conferences, has been recognized with two lifetime achievement awards, and has written five books, more than 200 articles, and nearly 1000 posts to his blog, Clive on Learning.